Hand embroidery and craft creation requires thread with superb color and strength. Iris Hand Embroidery and Craft Threads are both strong and durable as well as having vibrant color. 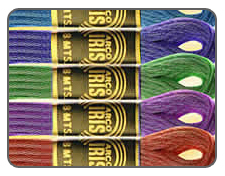 If you hand embroider, cross stitch, quilt or create craft projects using thread, Iris Threads can provide the color and durability that will allow your projects to last long into the future.